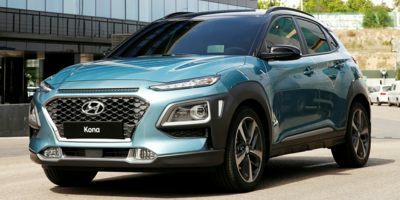 The 2018 Hyundai Kona is a 5 passenger Automatic transmission, 2 Wheel Drive Sport Utility Vehicles or 4x4 Sport Utility Vehicles. It is available in 4 trim packages, the Limited, SE, SEL, and Ultimate. The new Hyundai Kona invoice price ranges from $18,939 to $27,392, while MSRP ranges from $19,500 to $28,700. The 2018 Hyundai Kona is available in 10 exterior colors, Chalk White, Lime Twist, Pulse Red, Pulse Red w/Black Roof, Sonic Silver, Sonic Silver w/Black Roof, Surf Blue, Surf Blue w/Dark Gray Roof, Thunder Gray, and Ultra Black, and 3 interior colors, Black, Black w/Lime, and Gray/Black.